Ring in the new year at a tidepool! I am sure that you can't get enough of your kids and don't feel a need to get them out of the house. But, if you are a bad mom like me, you might want to divert them for a while from their electronic toys. Why not take them out to the clamber about on dangerous and slippery wet rocks? Throw in some big waves that might drag them out to sea. With any luck, they might not come home with you. See the full list of tidepooling posts for more pictures of what you can see at Abalone Cove Shoreline Park. The tide pools there are exposed whenever the low tide is -1.0 or more feet below the mean low tide. (0 means the low tide that day is the same as the annual mean low tide.) The NOAA 2009 and 2010 tide tables for Los Angeles yielded this information. This is our lucky week because the west coast of the US is experiencing some of our lowest daylight tides of the year and school is out! Don't live in LA? No problem. NOAA has the tide tables for the entire US right here. Did you know we live near one of the best tide pool areas in California? The tide pools of Abalone Cove, near Point Vicente on the Palos Verdes Peninsula, are exposed whenever the tide is 1 foot below mean lower low water (low tide). These especially low tides occur during daylight hours mainly in the winter months. If you look at the NOAA tide tables for Los Angeles, you will see that tides lower than -1.0 (feet below mean low tide) rarely occur during daylight hours. Yet, those are the only conditions that expose the tidepools at Abalone Cove Shoreline Park. Take a look at the gorgeous photos in Steve's slide show. The highest tide pools will become exposed about an hour before the minimum tide, and you can watch the sea anemones close as the water recedes. As peak low tide approaches, more and more sea creatures will become exposed to view. Our family has found octopuses, sea hares, limpets, mussels, sea urchins, sea stars, brittle stars, sea worms, hermit crabs, and myriad birds and sea plants. Wear sturdy shoes that can get wet. The rocks can get slippery so you want to wear shoes with a good grip. Protect your family from the sun with hats and long-sleeved shirts, but leave the chemical sunscreens at home. Those contain chemicals that make the sea creatures sick. Park admission is $5 per car; this is a cheap excursion if you carpool. Abalone Cove is a protected area, and it has made a little bit of a recovery since the 1970s from the heavy pollution in that area. But the tide pools are in jeopardy from poachers and ocean acidification from increased CO2 levels. Don’t miss this opportunity to show your children this ecosystem while we still have it. Did you miss anything lately? Well, I would say in the beginning I thought I had to keep work and home very separate. I thought that’s what you’re supposed to do, especially as a woman. You know, you don’t bring up your children and you don’t bring up the fact that you’re having these issues at home. I used to keep literally two separate calendars, and then wonder why I missed a few things. I still don't have any shorty, pithy answers for work-life balance, whatever that means. But the interview with Teresa Taylor, COO of Qwest, contains one interesting viewpoint (and journey). There was still enough black thread leftover in the bobbin so I made McCall's 5974, one of the Palmer/Pletsch "perfect knit dress" patterns. Can you believe that the bobbin thread ran out as I was hemming the last sleeve? I stopped and wound two bobbins for my next all black sewing frenzy. Like all the P2 patterns, the instructions were very thorough and clear; the pattern was well-drafted. My only complaint is about the neckline finish. They tell you to make a self-fabric narrow hem! I think that this dress deserves a separate strip of stretch fabric, stitched and turned to the inside. I added front pockets because always miss having pockets when I buy off the rack dresses. Using the pattern markings, I made a SBA and sway back adjustment. P2 patterns are known for printing these common pattern alterations right on the pieces. Next time I make a sway back adjustment (a tuck at the center back waist area), I will add length to the CB hem to compensate. Live and learn. The back doesn't look too bad. It fits me better than the dress dummy. That uniquely you dummy just grows and grows. The foam has enough pressure to launch that dummy into orbit someday. It took some wrangling to cut the dress out of the two yards of cotton jersey I bought at SAS fabrics. Here's the reason why. SAS is an odd jobber of discards from the fashion industry. The stuff is cheap for a reason. This section of fabric looks like it got caught and torn in the printing machinery. But it is a nice cotton with vibrant dyes and only cost $2.99 per pound. This dress took about a pound. Check out this cotton and lycra jersey I bought at the same time. Do you think I can entice Iris to ride the family bike more often if I made her a bicycle jersey out of this? Notice the misprint on the edge here, too. 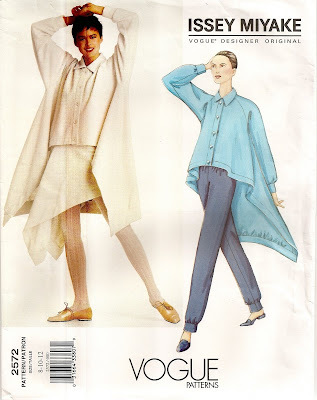 As long as the serger and sewing machine were threaded with black thread, I made a wearable muslin of Vogue 2572 out of a cheap synthetic sweater knit I picked up at SAS Fabrics. 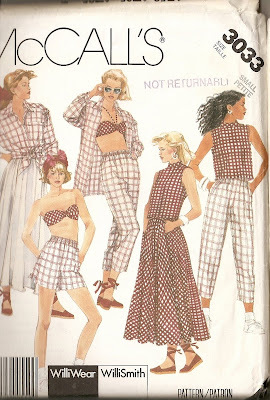 Now that I know how much I love this pattern, I want to remake it in nicer fabric. Perhaps a wool doubleknit with ultrasuede collar and front bands? I used a plain mitered top-stitched hem instead of the bands. Omission of the bands shortened the back slightly. I added length to the front side to allow room for the hem. Here's what the Issey Miyake top looks like on the model. Notice how happy she looks? And her comfy shoes? I don't think that is an accident. Here's the back of the pattern envelope so you can see the back view. 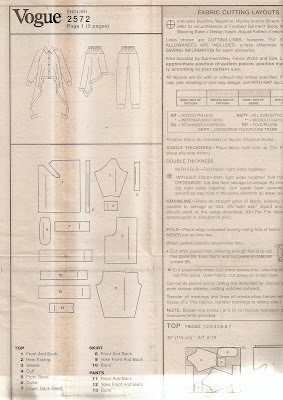 The construction is so interesting, I scanned in the first page of the instructions so you can see the pattern shapes. 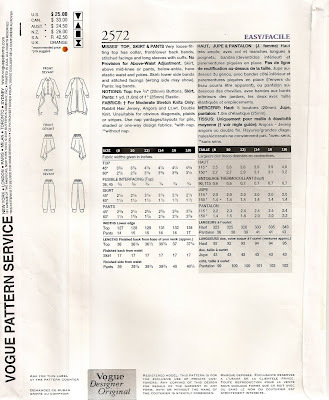 The front and back is essentially a rectangle with cutouts for sleeve and collar insertion. The full pattern review is here. More pictures with closeups of the mitered hem are on Flickr. I have previously blogged about all the goodies in the health care bill for Big Pharma, such as preventing the government from negotiating drug prices and blocking importation of lower-cost drugs from countries that negotiate drug prices. I didn't see the point of the 2009 Harry and Louise television ad campaign in which Louise says that she hopes congress will pass the deal fast. Did Big Pharma, the ones paying for this ad campaign, hope to get Americans to call up congress to pass the bill that their lobbyists wrote? Then the real reason hit me. By running these ads in favor of the health care bill, Big Pharma was flexing their muscles to show that they could also run ads against them, too. Those ads were a threat. We were robbed at gun point. Thanks, Harry and Louise! On Tuesday, we went to the library and checked out three books about beading, including Simply Beautiful Beading by Heidi Boyd. On Wednesday, we went to the Bead Studio and bought supplies to make the bee bracelet. Iris made this (with a little help) and will gift it to one of her playmates. I caught the beading bug and restrung two broken necklaces that I loved enough to save the pieces. The badge holder necklace was made by a friend at work (who has, sadly, moved away). I caught it on my desk drawer and pieces flew everywhere. I was able to salvage some of the beads. She knew my taste so well, I even already had matching beads at home. 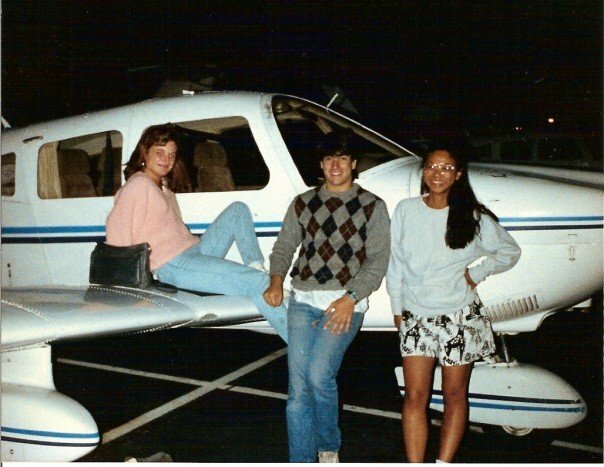 I bought the faux pearls at a white elephant sale fundraiser at my high school in 1982. It became my signature necklace until I broke it sometime in the late 1990s. Now that I finally learned bead stringing basics, I fixed it. Bead Studio is a 3 minute walk from my house. For Iris' birthday party, we took 9 kids there for a basic bead stringing class. People who have taken their classes can drop by the store and use the store tools at the back work bench any time they are open. One boy who attended the party has been at the store every day this past week, getting supplies to make presents for his entire extended family. There were so many cute projects in the book. There are so many cute beads at the store. This can become a dangerous new hobby. At least we will be supporting a good merchant. Randy, the owner, is a sweetheart. The staff loves beads and kids. It's a great place to have in our neighborhood. I think she has known who Santa Claus really is for years, but became more lax about putting up a pretense as she became older. Last year, we spent Christmas in a hotel room and she hung her stocking up on the television--the electronic hearth. When she went through her loot in the morning, she said it was like Santa had been following her around the past few days and bought her everything she admired (including Belle). A few months ago, she let it slip for real. She used Santa and Dada interchangeably while we were sewing together one afternoon. Then she realized what she had done. She commanded, "Don't tell dada!" Tonight, we went through the ritual of hanging up her stocking on the fireplace mantel. I asked her if she's been good or bad. "Good enough. ", she replied quickly. I am not so sure about that. I am still trying to locate a adoptive family for her. Bad Dad, the old softy, has already filled the stocking with presents. In case you missed it, I've tagged the full Santa Chronicles series. I've also figured out the discrepancy between my answer and NORAD's. I don't see Santa Claus' workshop because his workshop is exactly at the North Pole. I work with sun-synchronous weather satellites that do not go over the North Pole. (They have a slight inclination of ~8 degrees offset from the poles.) Thus, I have a data gap at the North Pole. No wonder I have never seen his workshop. The folks at NORAD are privy to imagery from more satellites. If they say that they saw Santa's workshop, I am sure they did. They've even captured Santa on film! We were browsing the selection at SAS Fabrics when she grabbed this and said, "You know, one of my favorite color combinations is pink and brown." Good taste; I love paisley and this 100% rayon crepe was only $2/yard. I bought 4 yards and only used a bit over 1 for the blouse. Someday, she will get a skirt or floaty dress with the rest. She already has a pair of brown corduroy jeans and a pink denim jean skirt that match. Kwik Sew 3274 went together quickly. She didn't cooperate and try it on before running out for her playdate this morning. I am not sure if it fits. I made a size 10 and need to shorten the sleeves by 2". A size 8 might have fit better, but she said she prefers it loose and floppy. The pattern review is here. This concludes my holiday knitting and sewing for Iris. There is one more item for her cousin, but I am going to wait until she comes for her visit and let her pick her own fabric. Then, back to making stuff for moi. Not much to say. The pattern (in Japanese) should be easy to follow if you read Japanese. Even though I don't, the diagrams were not too difficult to decipher. I scaled it down to 4/5 scale for Iris. The pattern shows a turtleneck sweater. I was working with 200 grams of this fluffy cotton/wool roving-type yarn. There was enough to make only the yoke. Iris didn't want a full sweater anyways. Here's a scan of the picture in the book, Aran Knit by Keiko Okamoto. You can buy the book from amazon.jp, yesasia.com or Books Sanseido. The full project details are on Ravelry. It looks great with the Black/Yellow/White version of Simplicity 5635. The leather flower in the top photo was the only thing I bought at the Nordstrom Anniversary Sale in July. (Recession Chic is so uninspiring!) I gave Iris a leather accessory in her favorite color for the first day of school for that extra boost of confidence. Addendum: She came home from the playdate. She tried it on. It fits! She lurves it. Climate scientists could learn something from U.S. poet. He makes a good point. When scientists talk to one another, we are poking at the data and the hypotheses asking, "Have we missed anything?" We are looking for errors and ambiguities so that we can stamp them out. The majority of people don't think the same way. It's hard to remember that, when we talk to other scientists all day. But, I don't fully agree with him. Science is a great detective story. I saw that, even as a child. I don't feel the need to beat other people over the head with that analogy. Ricky Rood posted an amazing response to tribalism concerning the global climate change debate. In the United States we devolve into something that is more like tribalism with sides taken based on the color of your uniform or who pays you the most. Discussion is based not on ideas and solutions, but on who makes a statement. Issues are advocated, and ideas are placed into extremes that take on attributes such as good and evil, for and against. The other side is wrong, and their intentions are of hidden control or hidden profit. This threatens our credibility and our viability. Read the whole thing, either in the original post at Weather Underground Climate Change Blog (the range of comments confirms his depressing assessment of the state of debate) or the American Meteorological Society Climate Policy Blog. You must really read the whole eloquent piece. He even invokes Shakespeare. I think I have a blog crush. I have been confronted by climate skeptics, both in performance of my soccer mom duties and at my paid job. I really don't know how to respond or what their motivations are. I chose science because I am naturally curious. I just want to know what is going on. Why, for some people, does that have to devolve into who is right and who is wrong? Science is hard. People are intractable. It's funny how the color zeitgeist travels. I assembled this collection of fabrics and yarn from my stash in October for my spring sewing. In November, I added some turquoise glass beads to knit with the yarn. Then Pantone declared Turquoise the color of the year for 2010. Kathleen is also tickled pink by the turquoise trend. This is cross-posted on the Madison and Lincoln School CSA blog. CSA deliveries are Thursday. Wednesday night, we clear out space in our refrigerator for the incoming produce. Many weeks, that means whatever veggies we have left over go into one giant frittata. Start by sauteing chopped veggies in oil, throwing the items in order of longest cooking times. When the veggies are cooked through (but not overly soft) pour in eggs scrambled with a little bit of milk or water. We typically use 6-8 omega-3 enriched eggs in order to cover the veggies. Cover and reduce the heat. When the eggs are almost done, you can dot some goat cheese on the top. Cover again until the goat cheese melts into gooey goodness. Serve with your favorite whole grain. It's a 15 minute meal if you use a rice cooker with a timer for your grain. Leftover frittata is wonderful for breakfast. By the sixth night of Hanukkah, he finally succeeded in installing the Airport Extreme so that Iris can use wifi at home on her iPod Touch*. He's taking a well-deserved break. On the sixth day of Hanukkah, I spotted camelia #1 in the backyard. @SB Latkas differ from hash browns because the egg helps it hold together. By the time we smother them in sour cream and apple sauce, no one can tell. A study published Monday in The Journal Of Child Psychology And Psychiatry has concluded that an estimated 98 percent of children under the age of 10 are remorseless sociopaths with little regard for anything other than their own egocentric interests and pleasures. There was a whole lot of mending, alterations and present making and wrapping chez BMGM this weekend, but this is the only thing I sewed from scratch that I am going to show. [I also wanted to write a post about how to take the temperature on a planetary scale, just to explain that we are not making this up out of thin air. But, that's a pretty big subject. And the weekend flew by while I was dithering about what to explain. I find that the things that confound and fascinate me are not necessarily the ones that confuse and interest others. How about you leave your questions and I try to answer them? No question is too basic, but fast turnaround is not guaranteed. Semi-fitted, pullover top has bias front and back, and short or long sleeves. C: sleeveless. I made view A, the one with short sleeves. I made a size 14 using a red and black rayon jacquard remnant. The fabric shrank when I pre-washed it, so the top ended up 1" shorter and with a narrower bottom hem than the original pattern. I also narrowed the back neck by 3/8". That was probably overkill. It might have fit better if I narrowed it by 3/16". The front and back is cut on the bias, the sleeves and back neck facing are cut on grain. I sewed the side seams with a 0.5 mm zig-zag and hand blind-hemmed the bottom to preserve the stretch. The rest of it was sewn conventionally. It looks fine on the dress dummy. It even looks fine on me unless I want to move my arms. Then the whole thing lifts up. I think I know the reason. 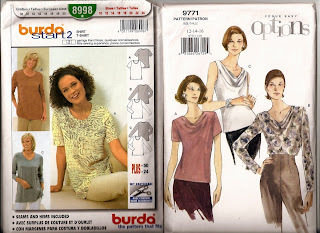 Compare this top to my favorite basic woven top pattern, Burda 8998. I laid the back pieces of both size 14s next to each other and found that the armscythe is slightly higher on the Burda and that the shoulder slope angles vary. A higher armscythe sounds like it would be uncomfortable, but it actually fits your torso better. You have more range of movement in a shirt with a higher armscythe. The front drape sure looks nice, even though I used a fabric with a tad too much body to allow the drape to fall easily. This top is part of my "no more orphans" project. I am making things to coordinate with items in my closet that aren't in my regular rotation because I don't have things to go with them. It all started with this red wool skirt from the clearance rack at Eileen Fisher. When I got it home, I realized it was an odd red melange that looked terrible with the red sweater set I already had. Matching reds is tricky. This rayon jacquard picks up the black lowlights in the skirt. The black jacket looks so boring with this ensemble. So I tried the gray cardi-wrap that picks up the gray tones in the skirt. Now it looks like I am trying too hard to look arty. This boiled wool jacket from Goodwill is a great color match for the skirt, but the neckline does not work with the blouse. I have 10 balls of Frog Tree Yarns pima silk in red. Surely I can come up with something. Why does the media keep referring to his "beautiful" wife? Would it be OK to cheat on a wife who is not beautiful? 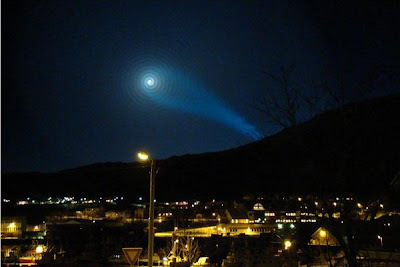 The mysterious light phenomena over Norway has been explained, but that doesn't change its beauty. The CSM article has more pictures and videos. Some may have thought it was a prelude to a close encounter of the third kind. But evidence quickly emerged that it was probably a result of a Russian ballistic missile test. The Russian explanation makes the most sense to William Dimpfl, a senior research scientist at the Aeorospace Corporation. Dr. Dimpfl, whose non-profit conducts missile research for the US Air Force and NASA, and who has carried out research on the way exhaust is emitted from rockets and the space shuttle, says he's fully convinced that the spiral plume was caused by a man-made missile. "I looked at the video and my first thought was it’s surprising how pretty it is," says Dimpfl. He said after watching the video that he observed no "atmospheric drag" on the event, which implied the missile was higher than 100 kilometers from the earth's surface – beyond the line between our atmosphere and space. The large, white spiral in the video and images is, in his opinion, "an illuminated solid propellent motor." The spiral, he says, "comes when you have a motor firing off the axis of the vehicle at right angles to the line that connects to the center of mass" yielding a "pinwheel." As to the tighter, bluish covered spiral that UFO believers have pointed to, he says: "The blue plume was from a motor that was still attached to the vehicle." He says the bluish color was from aluminum oxide that is typically added to the solid propellant used for such motors. "What I believe is that the blue is from solar fluorescence from chemicals in the plume. That’s just aluminium oxide that the sunlight is scattering from. Aluminum oxide is the chemical formula for sapphires, so what you’re looking at is sunlight scattering off lots of tiny sapphires." I love how he brings a little bit of poetry into a description of a rocket plume. 'Tiny sapphires' indeed. Remember what I wrote about our coworkers in Who's your city? The best part of my job is my coworkers. A luminous oil portrait of a boy, his face partially illuminated by a lamp, hangs in a prominent place in Bill's office. At first, I assumed he had commissioned a portrait of his son. He painted that in his first oil painting class. He'd just learned! And I am also very impressed with his violin playing. I had private lessons much longer than he, and I never played that well. PS There are more pictures of rocket plumes in Take your daughter to work a bit early. I've been meaning to post about the hacked climate emails, but I didn't have time to delve into the subject. Fortunately, Richard has summed up the situation nicely. Please read his post, Why we should worry about the hacked emails from CRU. I will wait. I am especially disheartened by headlines saying things to the effect that cutting carbon emissions will be expensive. Some, but not all, of the costs will be offset by energy savings, but it will likely cause some economic dislocation. But, the unstated assumption is that doing nothing will not cause economic dislocation. Global warming is already causing economic dislocation among some of the poorest humans on the planet--the ones who are not running up the carbon tab. What do we morally owe the Bangladeshi family of subsistence farmers whose wells have turned brackish due to salt water incursion from sea level rise? No, buying a carbon offset every time we fly won't raise enough blood money to compensate them for their children who will be malnourished and die from our callousness. to put my 9 yo up for adoption? I am flat on my back with a muscle strain, listening to the wind. How often are the winds in southern California as strong as those in the northern plains states? Puzzled? Read the Windsday series. Our raingauge blew over, but I guess we got a bit over 1", similar to neighboring rain gauges I found through weatherunderground.com. When Iris was a newborn and when I was really sick, my in-laws would come over with a cooler full of food. Or my mom would fly in, walk to the grocery store around the corner, and then cook up a storm. They would not leave me without a freezer full of food. They've had quite a few health challenges this year and are in no shape to travel to our house. It gave me pause to realize that now I am the one cooking in huge batches and bringing them over to their homes. I also sent down black bean and sweet potato salad (w/ corn but sans jalepenos) and apple-persimmon cake via my sister-in-law. We met up with her at a hotel en route from her home in northern northern California to San Diego. My mom received some of the same cake, but the rest of the meal came from Whole Foods. Bad Dad pre-ordered it on the internet and specified the WF most convenient to my mom's house. WF was mobbed on Thanksgiving morning. We checked in at a computer kiosk set up for the event, paid at the register, and then went outside to the truck in front of the store from which they passed out the pre-ordered Thanksgiving meals. A meal for 4? Hah! We ate it the next night, then divided up the leftovers. We had turkey sandwiches for lunch this week. Tonight, I made turkey salad and turkey and veggie soup (CSA delivery day). Mark made turkey fried rice. That's it for our leftovers. Hiking the lip of a volcano in Sibley Volcanic Regional Preserve. Yes, but where is Sibley? We hiked it in the afternoon, after I spent the morning at Stone Mountain and Daughter Fabrics with owner Suzan Steinberg in the green sweater. (Steinberg. Stone Mountain. Get it?) She and her dad opened the store in 1981, but I didn't start shopping there until 1986, when my former boss used to send me over for sewing supplies*. I wanted to take the whole button inventory home with me, but the Cotton Shop by my house has a good selection of buttons. I opted to buy a whole bunch of woolens (which don't sell well at the beach), a silk/cotton poplin and some fabulous knits home. Then I met Mark and Iris at Shakespeare and Company Books. We also visited Moe's Books. Mark went to Amoeba while Iris and I checked out the offerings at Hat Fetish. She got the hat, but not the glasses. These, sadly, did not come home with us. By then, we were ravenous. I inhaled the cornmeal waffles and fried chicken at Brown Sugar Kitchen. Note the collard greens and black-eyed pea salad in the background. All polished off quickly. After we ate, I chatted with chef/owner Tanya Holland. She said that she might open up in LA and some people had suggested West Hollywood or Redondo Beach. I squealed, "Yes, please! Redondo Beach needs you!". Then we hiked on the side of a volcano and came downhill to this sunset. The Golden Gate Bridge is probably a dead giveaway. * My boss at the costume shop at Berkeley Shakespeare, now California Shakespeare. But if I had mentioned which boss above, that would have given away our location. Did you know the Berkeley and Oakland hills were volcanic in origin? It hadn't occurred to me. But it makes sense, given their proximity to Mt Diablo, which is clearly volcanic. Hatfetish.com is actually the internet storefront for brick and mortar Berkeley Hat Company, which I also learned about while working in the costume shop. The really skilled craftspeople used to buy wool hat blanks and magically shape them to match their vision. While they were busy, they sent unskilled labor (me) out to buy supplies. We later crossed the Bay Bridge to go to grandma's house for Thanksgiving. Bad Dad and I love to pat ourselves on our backs for selecting parents that live in top vacation destinations. We bought so much fabric and so many books, plus two big straw hats, we were not sure we could pack them into the car on the way home and still see out the back window of the Prius. Fortunately, I have masterful spatial skills. We were aided by the fact that we left some stuff behind for my mom. We also met up with my sister in law (and Iris' cousin) en route and gave her a cooler full of food to take down to Bad Dad's parents in San Diego. I gave Iris' cousin her pink leopard print hoodie. I could kick myself for not taking pictures of Iris and H together in their matching hoodies. Perhaps I can do that later this month. The adorableness needs to be documented. 7 days, 6 nights, desert, East Bay and SF Peninsula. Whew. It's good to be home (and done with the laundry). Our family went to Vegas and the first thing we did after checking into our hotel is search for Thai food in a strip mall.If Jonathan Gold says Lotus of Siam is the best Thai food in the US, then we have to try it. Mark and Iris walked around the strip one evening, to watch the fountains and such, but I stayed in the room to rest. I haven't been feeling well lately and smoke was the last thing I needed. What else did we do? Bad Dad was there to work, but we made a mommy and me trip to the Hoover Dam. We took Belle along on the trip; she is in almost every photo. We took the long tour inside the dam. They measure the distance between the metal pins to gauge shifting. The obligatory photo of the generators. Look at the bicycle inside Hoover Dam! Photo op at the air vent. The new visitor center has a very nice exhibit showing how they built the dam, and how they generate electricity from the potential energy of the water. More on that later. We also visited the Liberace museum. Many think he was a kitsch joke. But he was so much more than that. He invited my sister, our mom and myself to one of his concerts and put us up in the VIP box. Our violin teacher played in his orchestra. By all accounts, he was a very nice man. Besides, he loved clothes and kept a whole army of couturiers employed. More on that later.